I stumbled on GitKraken the other day, and decided it may be time to overcome my extreme dislike of Git GUI tools. You see, I learned Git on the command-line first, and haven’t found a GUI that matches that control and power. Until now. I installed GitKraken on Windows, and launched it for the first time. The on-boarding process the developers have created is wonderful. Each page of settings is explained to me through tool-tips. I set up Github and Bitbucket integration, and loaded my SSH keys for my private servers. Set up was a breeze. I cloned a repository to from Bitbucket to my wwwroot folder. Perfect. I made a few changes, staged the changes, then committed them in with a nice message. Finally, I made some changes on a different machine, and pushed those changes, and then pulled from my Bitbucket in GitKraken. Now, these changes I made were deliberately difficult. Something that would need a manual merge, and would frustrate me normally, doing it from the command-line. GitKraken started the pull, and launched Beyond Compare for me to manually merge the files, and then carried on. It was a dream. Unlike most of the Git GUIs I have tried in the past, GitKraken isn’t tied to the file explorer or an IDE. It is it’s own stand alone application. This means updates don’t need a reboot like the Tortoise tools do. 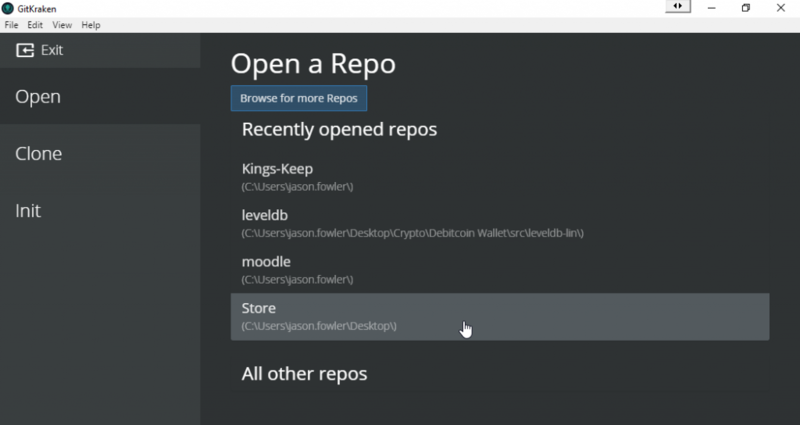 GitKraken is also a single place for all your Git repositories. This may take some getting used to, but it does make for a less cluttered taskbar. Rather than interact with multiple dialogs in half a dozen windows, you use one window for all your repositories, and swap between them easily. It even located some repositories I had in folders on my desktop for me! This means the workflow I use on my desktop/laptop is now the same as the one I use on the go with my tablet. That helps keep my headspace a little less crowded. It’s amazing how this software has managed to keep all the power of the command line, without becoming overly complex. You can browse local and remote branches, and view stashed changes. 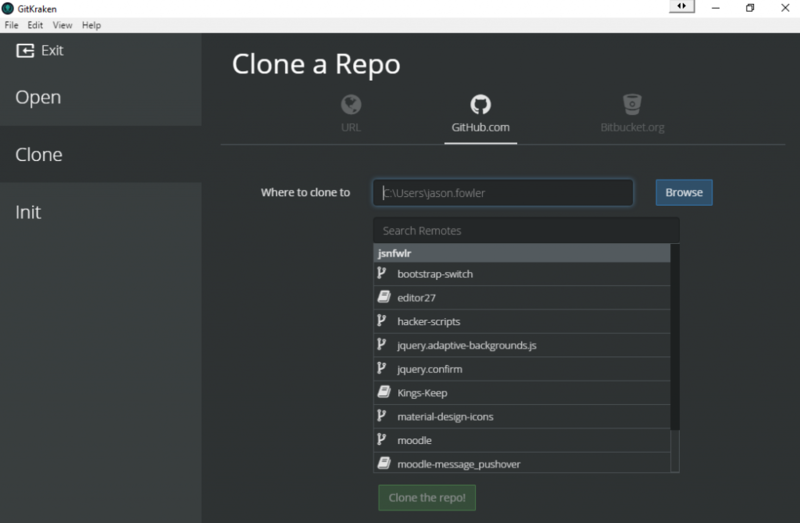 You can merge, pull, push, revert, rebase – everything you expect from a Git client. And doing it through the GitKraken GUI is just so much easier. The only let down I have experienced is one that should be easy to overcome – the built in SSH agent doesn’t allow for unlocking SSH keys protected with a passphrase. I’ll have to create a single copy of my private key that doesn’t have a passphrase, just for git access now – it’s not ideal, but nor is it a deal breaker (and it’s probably only an issue on Windows, when you aren’t using a dedicated SSH agent). (Get cracking) … Yeah, I laughed too. Anyway, head over to the developer’s site , download it for your chosen OS – it works on Mac and Linux as well as Windows – and give it a shot. The dev team over at Axosoft have just released a pro version that adds user profiles – work + personal repositories can now be separated, but managed under the one account. It also handles merge conflicts internally – no need for Beyond Compare! Axosoft have generously given The Brazen Geek a 1 month promo code for Pro access to share with our readers. Now you have absolutely no excuse not to try it out! Would love to know how you got Beyond Compare working with GitKraken. It may be a pro-only feature – either way, there was a setting that allowed me to set it as the merge tool. great tool but the promo code is not working..
Yeah, it was only valid for the month the article was published, sorry.